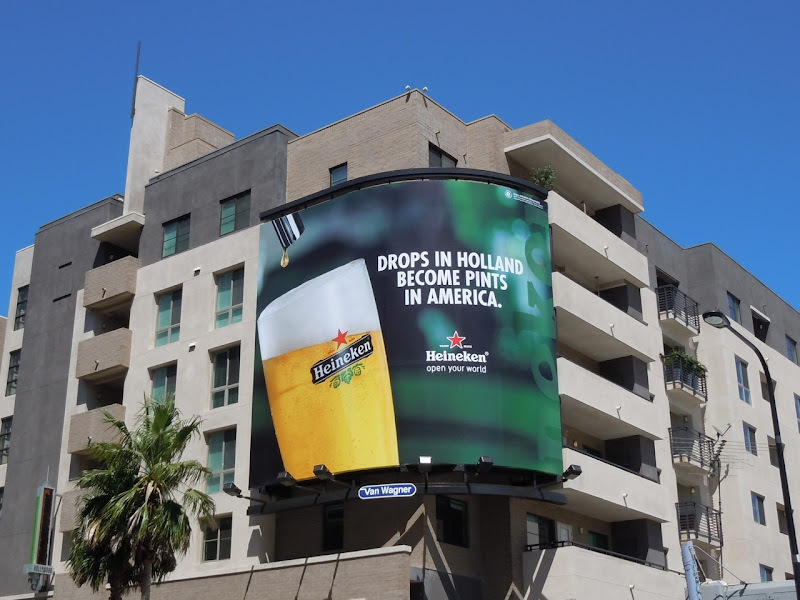 Heineken's giant new beer billboard really stands out and it's nice to see different colours, the green and golden hues, adorning the 9000 building along L.A.'s Sunset Strip rather than the usual blue background to most ads that appear there. 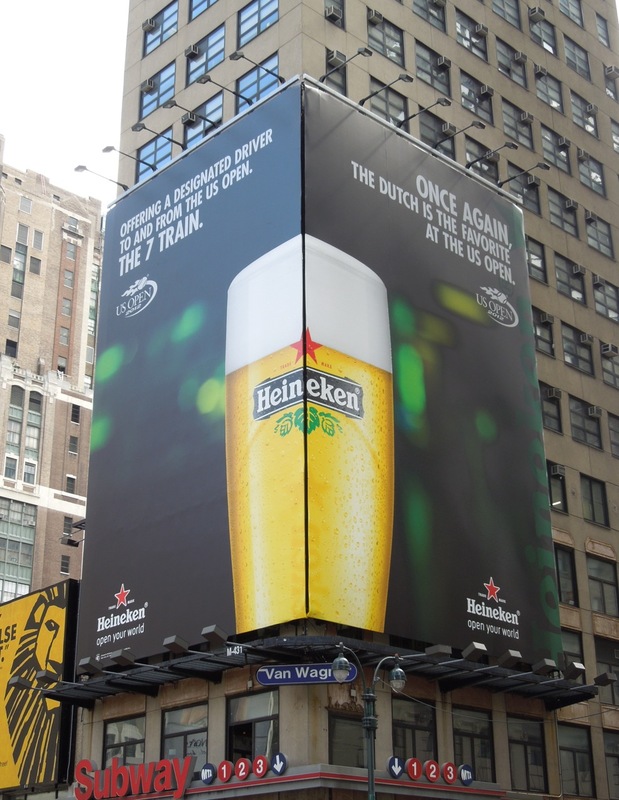 There's something oddly mouth-watering about a drop of beer poised to fall into a waiting pint glass, especially when it's this big. 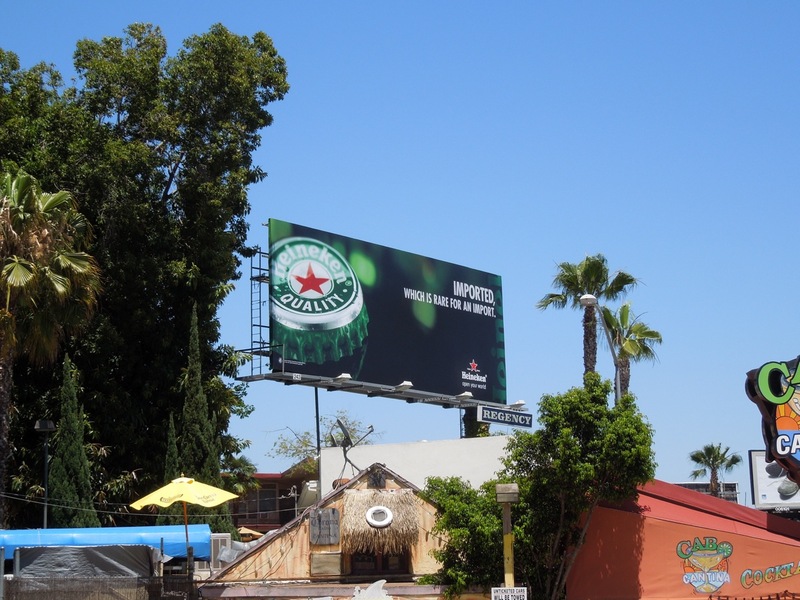 The massive billboard creative was snapped on July 23 and the smaller standard version photographed along Pico Boulevard on June 21, 2011. 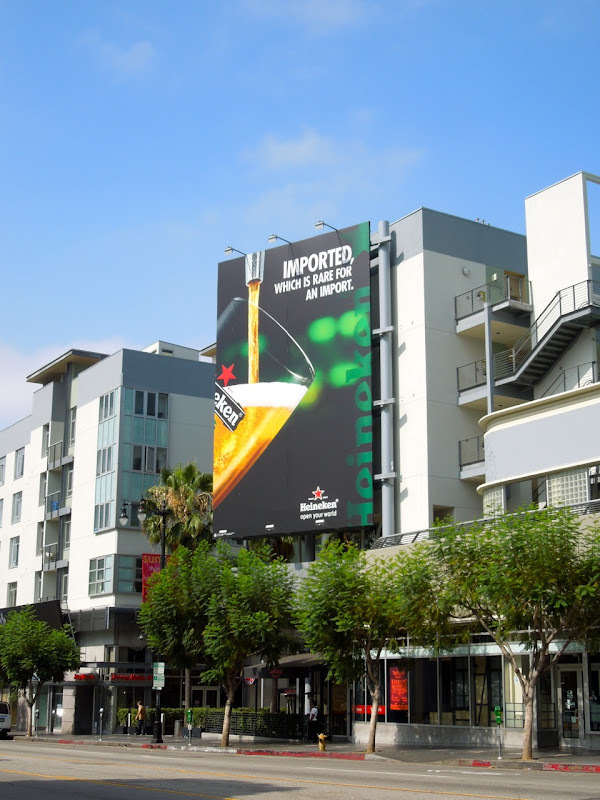 Be sure to check out previous examples of giant billboards in this location, like The Big C's season one billboard, Maker's Mark whisky billboard, Nurse Jackie season three billboard and Transformers: Dark of the Moon movie billboard. 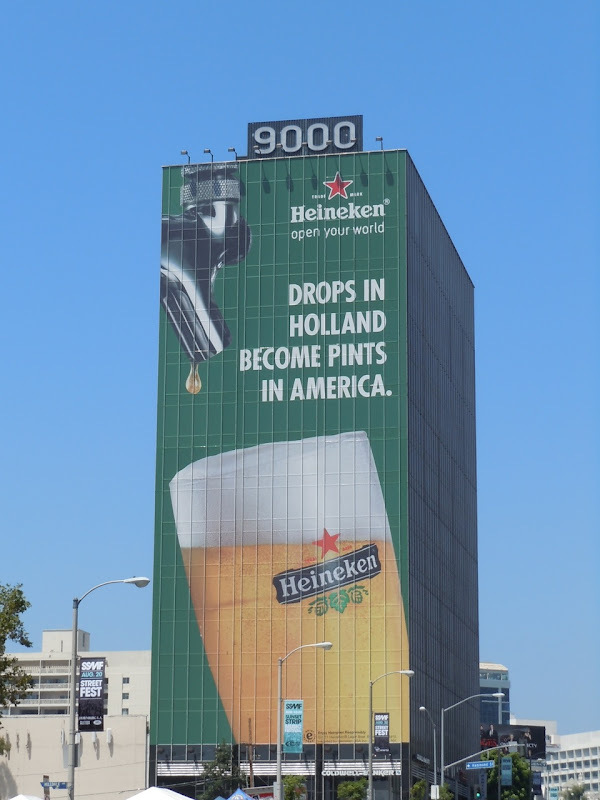 UPDATED: This square version of the vibrant Heineken creative was snapped along Highland Avenue at Hollywood Boulevard on August 21, 2011. 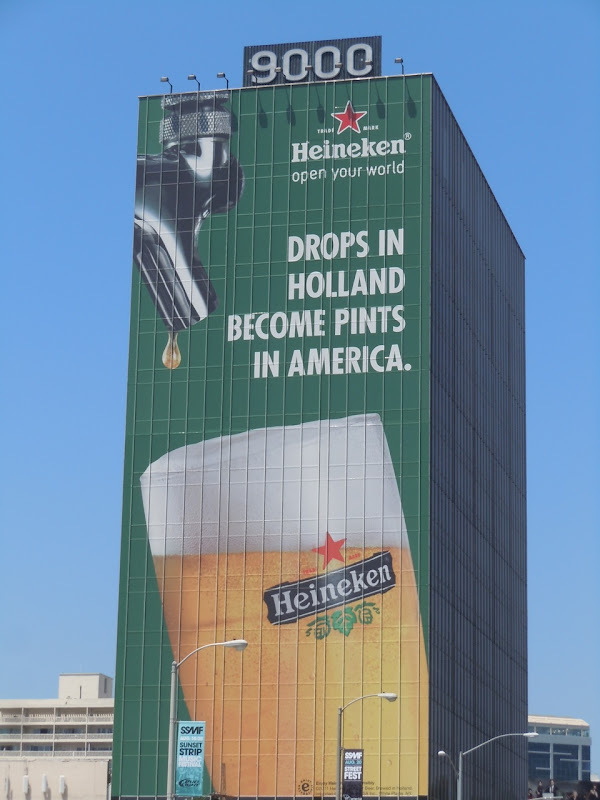 UPDATED: Here's a witty new creative for the Dutch beer focusing on its quality and import credentials. 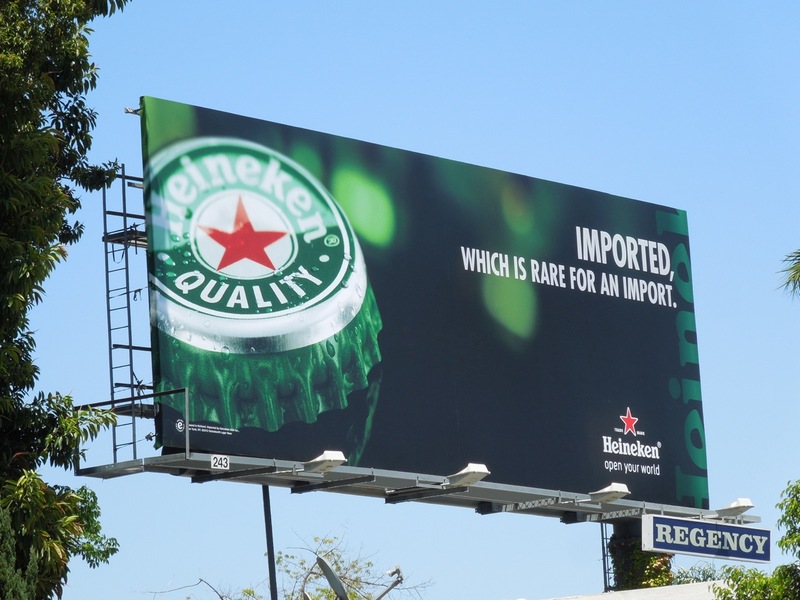 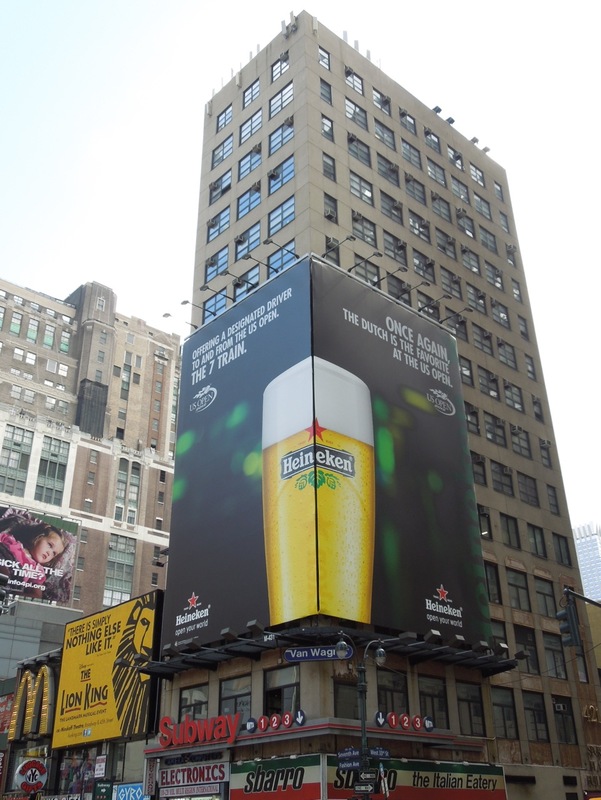 This Heineken 'imported' billboard was snapped along Sunset Boulevard at Sweetzer Avenue on June 5, 2012. 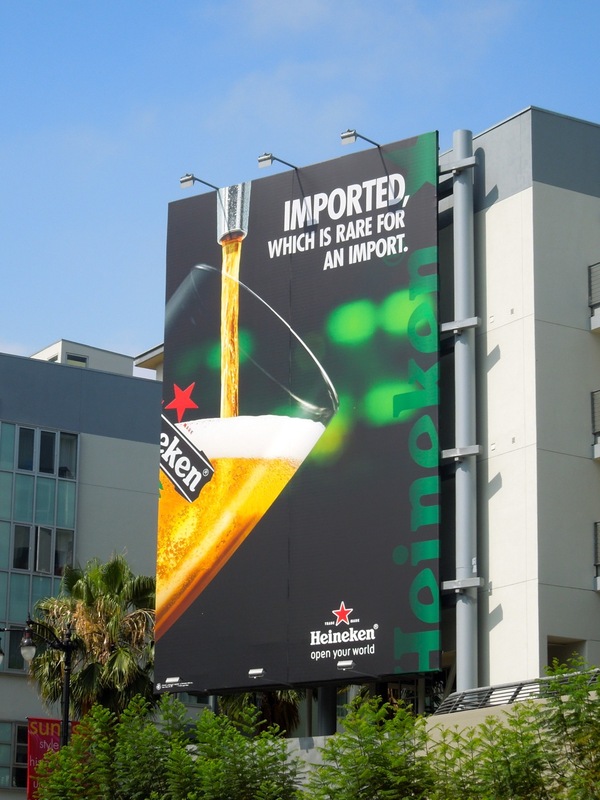 Plus continuing the campaign, here's another creative to accompany the 'imported' tagline, snapped at Sunset & Vine in Hollywood on July 2, 2012. 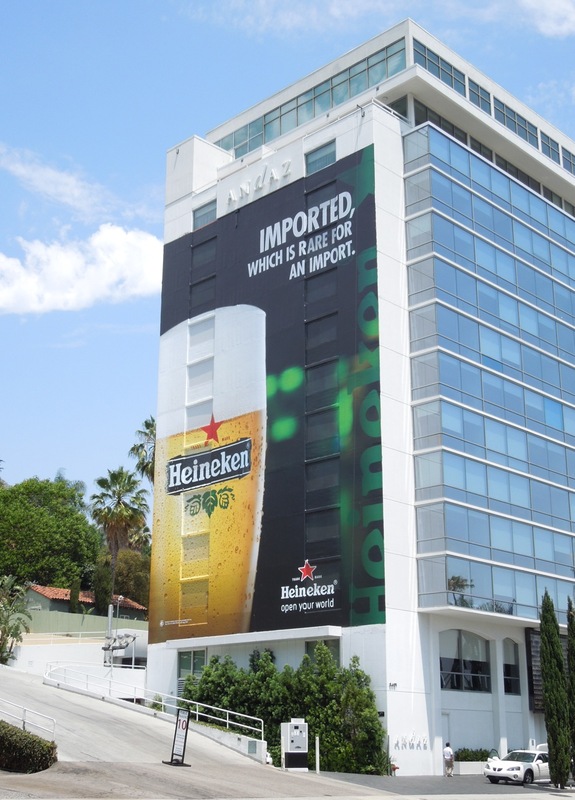 UPDATED: Here's a super-sized version of the 'Imported' creative on the side of the Andaz Hotel in West Hollywood on August 4, 2012. 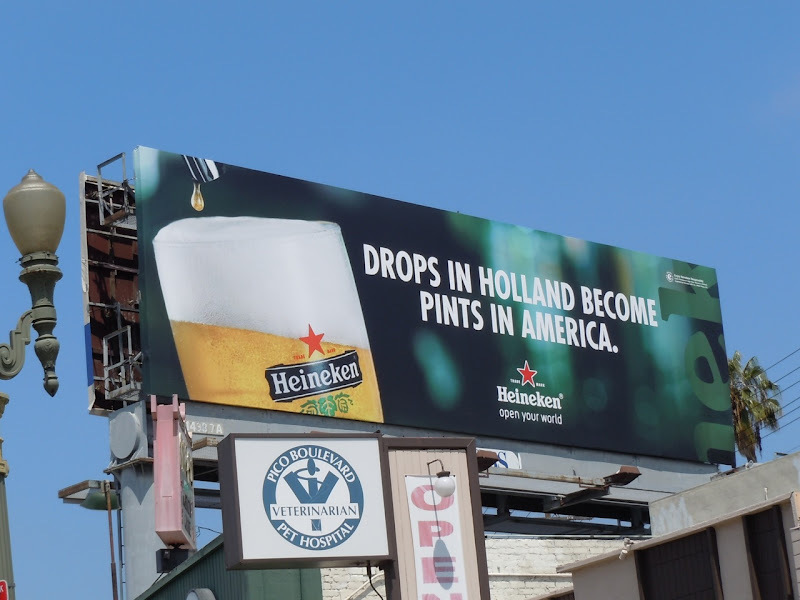 UPDATED: The Dutch beer invasion isn't just happening on the streets of L.A., here's some billboards for Heineken around New York City. 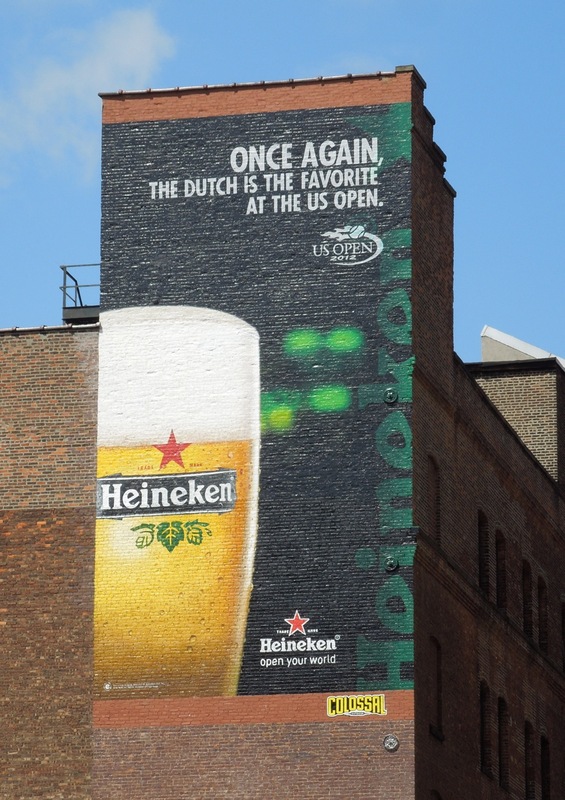 These billboards marking Heineken's 21st year as the U.S. Open Tennis sponsor were snapped along 7th Avenue near Penn Station and in the trendy Meatpacking District on August 28, 2012.